Hi, Monday. It's been a long time since I last saw you. I think I'm ready for you today. A little. 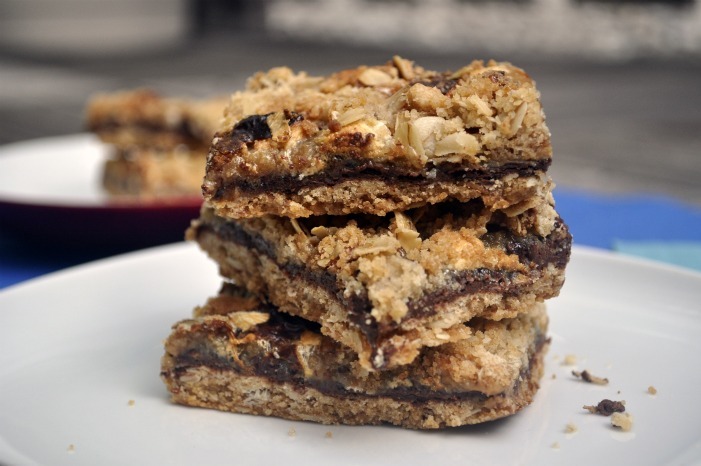 I also teased you on Friday with tales of chocolate marshmallow oat bars. I hope you're not mad at me. I made these for my bro-in-law's birthday last weekend. I created them on a whim. I wanted to make something delicious and decadent and a little over the top. Those always make the best desserts, don't they? I was also in the midst of saying goodbye to Cat, and thus rummaging through my cabinets trying to keep oh-so-busy while she left us trying to devise something with what I had on hand. Oats? Good. Marshmallow? Good. Chocolate? Goooooood. These bars literally came together in minutes. I imperfectly threw them together, tossed them in the oven and they were ooey gooey in no time. I let them cool about 85% of the way, and then cut them up, wrapped 'em and took these little bars of heaven to Steve's birthday celebration. I liked them. A lot. Preheat oven to 400 degrees. Line a 13x9" pan with foil (one strip lengthwise, one strip widthwise), letting the foil hang over the edges. Grease well. Mix the shortening and sugar together in a bowl. I used my stand mixer, but a hand mixer (or even by hand) would work too. In a mixing bowl, mix together the flour, baking soda and salt. Beat into the shortening & sugar mixture. Stir in the oats. Press 2/3 of the mixture into the greased pan. Melt the chocolate (I do it via microwave) and carefully spread over the oat dough. Top with marshmallows and pour sweetened condensed milk over it. Top with remaining oat dough. Bake for 25 minutes. Let cool and set. To cut up, remove from pan by using the foil as handles. Peel away. Cut off all the edges and then cut into bars. Devour discarded edges immediately. Subsequently devour bars. I think you could come up with lots of ways to enjoy these bars! 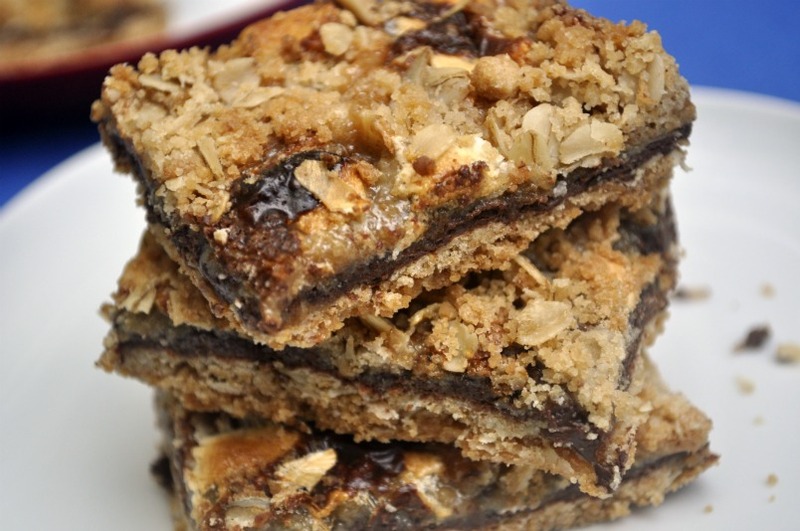 Different chocolates, candies and flavors could easily be in the center of these bars! I love them! 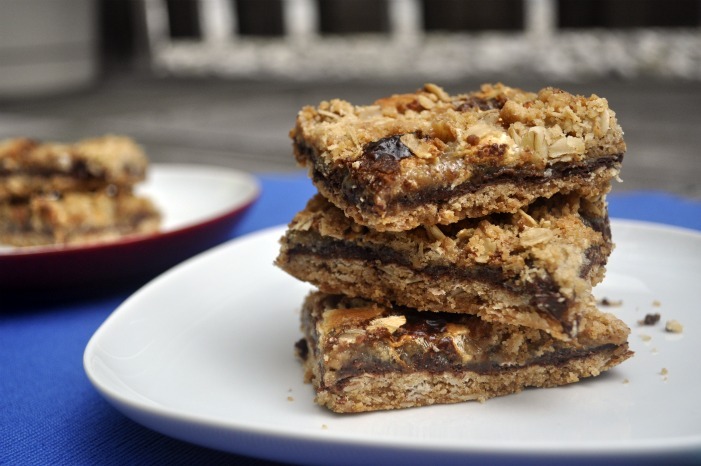 What other fun combinations would you put into these oat bars? What do you do/eat on a solo weekday night?